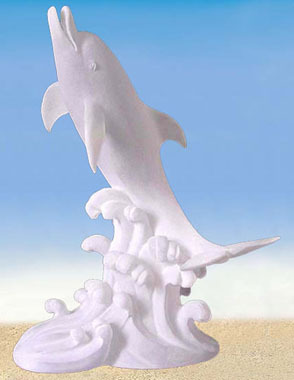 This First Breach Dolphin Lucite Sculpture is a three dimensional work of art. It expresses an idea or feeling, beautifies, inspires and enhances a living environment. Each of our Frosted Lucite Sculpture is intricately detailed and distinctive to add beauty to your office or living room. Display on a light stand from any angle to enhance the beauty and elegance of this tasteful piece. It is sure to be treasured and adored by all. Whether it is your first piece or one of many in your personal collection, it will bring you and your family a lifetime of pleasure. 5.25 inches D. x 7.5 inches H.